When I came up with it, I thought the idea of a ‘guilty displeasure’ was genius. An album that you knew you were supposed to like, that had become established in the annals of rock history as a key work (or potential key work) but that you just hadn’t clicked with yet. Throw it into the DRC blender, let the other guys point out where you are going wrong and, hey presto, you have another once-neglected classic to add to your trove. There are plenty of albums in my collection that fit this bill. As a careful, as opposed to carefree, purchaser of records I will often research an album in minute detail before acquiring it, to such an extent that I often know the song titles, running time and recording history before hearing a note! I am definitely the opposite of a completist. I don’t think I own all the albums by any major artist who has stuck around long enough to make more than a couple of records (although I do own the Nick Drake box set, he hardly has an extensive discography) as I will ditch an artist as soon as I sense that I no longer need any more music by them. So I should only have a few guilty displeasure records in my collection; yet there are loads, and most of them tend to be the established classics, those BIG records that are firmly of the canon, in the top 50 of the latest (ridiculous) top 1000 records of all time lists. You know the ones: Sgt Pepper’s, Blood on the Tracks, most Neil Young, Funeral, Transformer, The Stone Roses, Screamadelica, Murmur. In other words, records that are so highly regarded that no amount of scouring the music press or internet review pages can put you off…because there just isn’t much written that could put you off. But I knew before our meeting that my mind is more-or-less made up about these records, that no amount of persuasion would alter the way I felt about them. So I went for The Meadowlands instead. Thought it would work. It didn’t! 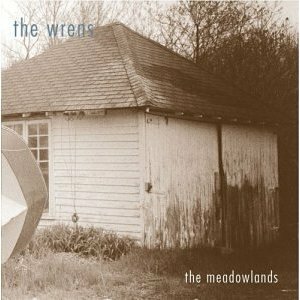 I have only owned The Meadowlands for about six months, having wanted to own it for a few years beforehand. I first became aware of the album around about the time I started following Pitchfork – it was in their 2003 year end top album list (number 18 and scoring a whopping 9.5 – I put that in just for Nick, knowing how much he likes ‘the numbers’ – in their review) and I clocked it as an album that I would probably get on with. Over the intervening decade the album’s reputation seemed, if anything, to grow! In the end of decade chatter it frequently cropped up as one of the most important and rewarding releases of the noughties and was talked of as a grower of rare depth and staying power. Just my sort of thing. I probably had unrealistic expectations by the time I slapped it on the turntable for the first time. What’s wrong with it? Nothing really. Most of the songs are pretty interesting with nice melodies, good to great lyrics, they shift around a bit, usually building to a climax but employing a range of dynamic shifts along the way. I certainly don’t dislike the record but, much in the same way Nick (wrongly, as it happens) feels about Pet Sounds, I don’t love it like I should…and I am beginning to feel I never will. In the back of my mind I am holding on to those comments I read that said, ‘hang in there, the time you invest will be more than paid off when it clicks’ but I have really tried already with The Meadowlands and it hasn’t clicked yet. I thought perhaps that playing it at DRC would do the trick but, if anything, the views of the fellow members (with the exception of Graham, who seemed to quite like it) reinforced my own. I think Rob, in particular, said something that rang true: ‘it all sounds a bit flat’. I know what he means and, whilst I haven’t completely given up on The Meadowlands yet, I do wonder if it will ever become anything other than a (slightly) guilty displeasure. Graham listened: For a first listen I quite enjoyed this. Some tracks seem to ramble rather than develop, but I would certainly listen again (not that Tom would lend it to me when he saw the state that Green arrived in!). Rob listened: This sounded inconsequential to me, I’m afraid. I’m aware of its rep, but it came across like run of the mill alternative rock, recorded just badly enough give it a patina of faux authenticity and desperation. I’m sure it’s completely heartfelt, and it appears to be a record that many people hold dear to their hearts, but Tom, i’d give up if I were you. Nick listened: Writing for Stylus from 2002 to 2007, there were many, many record enthused about by my compatriot reviewers which I did not get, or, indeed, from the tone of their enthusings, did not even bother to try and acquaint myself with. This is one of them. The cover is awful; who knows where the phrase “you should never judge a book by its cover” originated, but I thoroughly disagree – book, and by extension record, covers are MEANT to be judged, are meant to lure you in, to make you want to hear a song or read a story, to offer an impression of what might be contained within. I guess Meadowlands did that for me; clumsily composed, solipsistic, monochrome, lacking definition, dated, without personality… I’m unsure whether I’m describing the artwork or the record, because this just sounded like pointless, identikit American woe-is-me pseudo-meaningful indie rubbish, and I suspect that a huge part of its mythos is based around its backstory (misery, delays, personal troubles, record label failings; who givers a toss? ).